I'm very happy to participate in an impromptu group show in Miami in conjunction with/response to Art Basel. ICEBERG'S TONGUE is organized by Baris Gokturk and James Weingrod at the YoungArts Foundation Studio in Miami, where James is artist in residence. 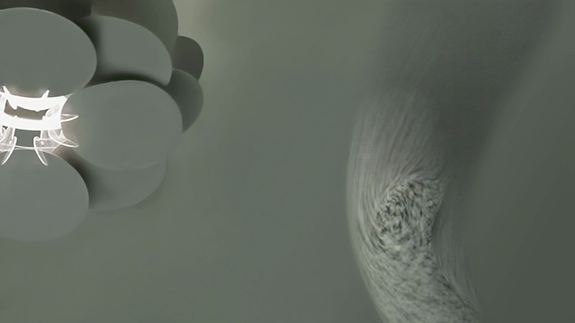 I will be showing my video series Modeling Big Data. If you're in Miami, please come for a visit. ICEBERG'S TONGUE is one of two concurrent group shows in the same space together with SUNK, organized by General Practice's Carlos Rigau. The exhibition includes works by artists Emmy Catedral, Katherine Behar, Sarada Rauch, JD Fernandez, Claudia Pena Salinas, Caroline Burghardt, Baris Gokturk, and Becky Brown. Happy to announce that my new video series Modeling Big Data will be included in Re:Collect, a group show at Re:View Contemporary in Detroit. MBD is showing at the invitation of the wonderful Melanie Manos. If you are in Detroit, please stop by. The opening will be held in conjunction with Midtown's Noel Night. I'm thrilled to visit the University of Kentucky this fall, to present my solo exhibition, "E-Waste" at the Tuska Center for Contemporary Art. While at UK, I will be an artist-in-residence at the College of Fine Arts and the College of Arts and Science and will work with students in both colleges. "E-Waste" is an exhibition of new sculptures and videos. Combining machine-made, handmade, and organic forms, including a "fossilized" 3D printer, the installation offers a meditation on consumer technology's environmental impact, digital labor's perverse acceleration, and big data's corporeality. "E-Waste" is co-produced by the College of Arts & Sciences and the College of Fine Arts in collaboration with CELT (Center for the Enhancement of Learning & Teaching), supported in part by a PSC-CUNY Award, jointly funded by The Professional Staff Congress and The City University of New York. UPDATE: Here is a press release about my visit, and a link to my appearance on "Office Hours" on UK's 88.1 WRFL. I'm looking forward to visiting the University of Michigan to speak as part of a FemTechNet video dialogue. I'll be a guest in FemTechNet class co-taught by Irina Aristarkhova and Lisa Nakamura, and will speak along with Marina Grzinic about "Cyberfeminist Creativity." In July, I'm looking forward to my first trip to Africa. 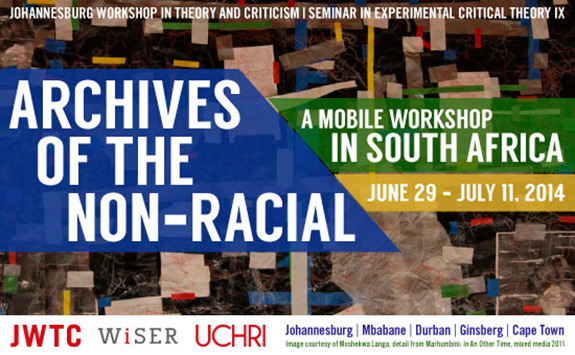 I'll be traveling to South Africa and Swaziland, to participate in Archives of the Non-Racial, the Johannesburg Workshop in Theory and Criticism. This mobile workshop is hosted by WISER at the University of Witwatersrand and will feature a range of local and international speakers and performers. Participants include: Ahmed Kathrada, Ackbar Abbas, Xolela Mangcu, Ruha Benjamin, Keith Breckenridge, Mwelela Cele, Sharad Chari, Angela Davis, Gina Dent, Philomena Essed, David Theo Goldberg, Siba Grovogui, Ghassan Hage, Salah Hassan, Mlungisi Dlamini, Bronwyn Law-Viljoen, Richard Quaz Roodt, Premesh Lalu, Achille Mbembe, Dilip Menon, Neo Muyanga, Kelly Gillespie, Deborah Thomas, Francoise Verges, Michael Keith, Alex Lichtenstein, Roberta Estrela D' Alva, Ntone Edjabe. Disorientalism is excited to visit Montréal this summer, where we will participate in "Manifest! Choreographing Social Movements in the Americas" the 2014 Encuentro organized by the Hemispheric Institute. We will present Maiden Voyage, the third chapter in our series, "The Food Groups." 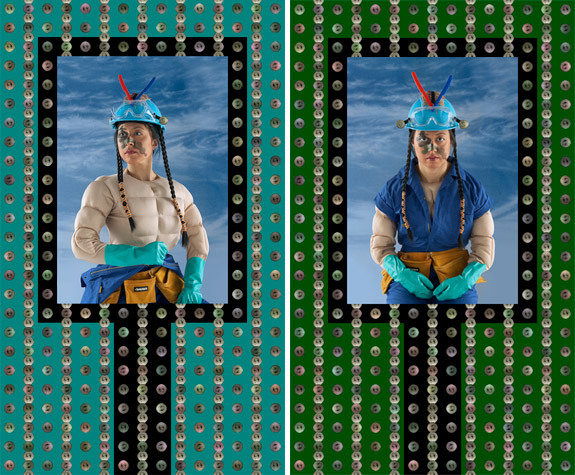 We'll be showing video with "thangka cloth" portrait banners at the main FOFA Gallery at Concordia. Disorientalism, Maiden Voyage; Laurence Parent, Montréal *In/Accessible; Nikolai Kozak, Cáfila | Cohue | Host; Rafael Gamboa, We (Are) Like You; Zach Blas, Face Cages. Disorientalism is thrilled to return to our old home in Chicago for the Rapid Pulse festival, hosted by our friends at Defibrillator gallery. We will perform Brown Bagging: Quality is Our Recipe, from "The Food Groups" series. A live multimedia performance that picks up on the narrative begun in Disorientalism's "Brown Bagging" installation. 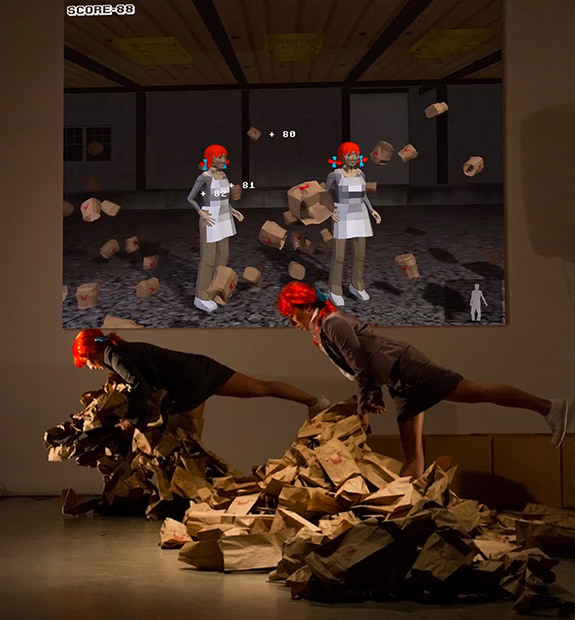 We find the Disorientals in Wendy's Old-Fashioned Brown Bagging Factory where they play their own avatars in a custom Kinect video game, "Participation May Vary." In Jersey City, I'll be presenting a new interactive installation curated by Roger Sayre at The Brunswick Window. High Hopes features a Roomba, a rubber tree, and Frank Sinatra. THE BRUNSWICK WINDOW presents "Katherine Behar: High Hopes." Behar's work explores excessive and gendered forms of productivity and work in gadget-saturated contemporary life. 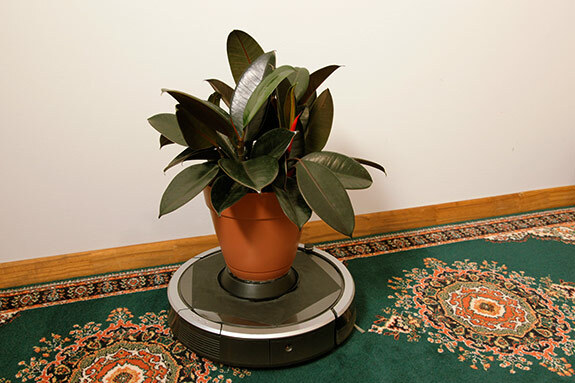 In High Hopes, an unattended Roomba fastidiously cleans a carpet while balancing a rubber tree plant strapped to its back. It tries against all odds to "move that rubber tree plant," in the words of Frank Sinatra. Two of my E-Waste sculptures are included in Trash, Toxicity, Transmission, a show organized by Jamie Skye Bianco at the Maker Space at the Cultural Studies Association Conference at the University of Utah. Lateral. We are working with an incredible group of scholar/practitioners (final list of participants coming soon). Jamie Skye Bianco, Karen Gregory, and I have organized a series of panels on the theme of "Hospitality/Hostility" for the "Anthropocene Feminisms" conference at the Center for 21st Century Studies at the University of Wisconsin, Milwaukee. ABSTRACT: "Hospitality/Hostility" takes up one of the conferences key questions: How should feminism in an anthropogenic age take up an altered relation to - an increased attention to or concern for - the nonhuman world? Working with materials, such as digital art, sculpture, text, our panel takes up the theme of "Hospitality/Hostility." Here, we not only evoke and explore the tension inherent in the notion of hospitality, but we attempt to move away from the notion of antagonism (a notion deeply situated in philosophy, ethics, and theories of labor) to consider a fuller realm of "agonists" or agents that work for and against, partially, and inversely among and with each other. Such a move not only draws attention to the plurality and dynamism of the Anthropocene, but helps to resituate feminist thought among, literally, a "host" of other options. I'm thrilled to give a talk about my work at the Department of Media Study at University at Buffalo, SUNY. 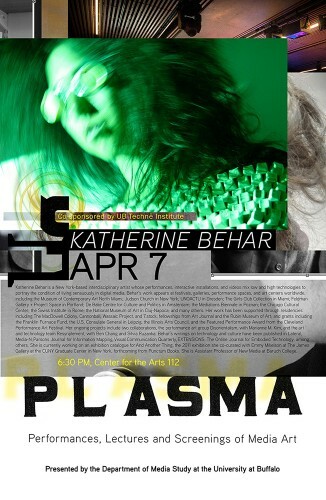 I'll be presenting in the PLASMA 2014 speaker series on April 7. Other speakers in the series include Cynthia Hopkins, Jay Sanders, Tony Cokes, Katherine Behar, Alessandra Renzi, and Tony Oursler. This event will also be streamed here on the night of the event. 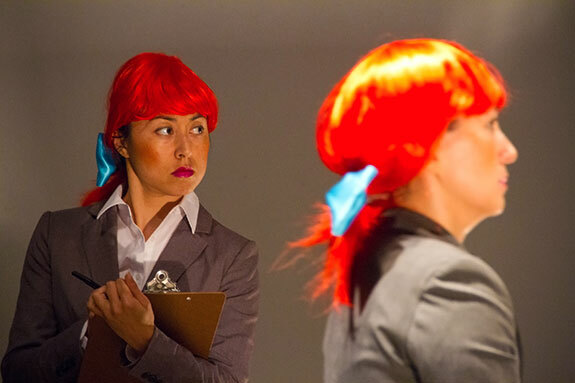 Disorientalism will travel to Buffalo this spring to participate in "Performing Economies". We will perform Brown Bagging: Quality is Our Recipe, from "The Food Groups" series. UB will host "Performing Economies," a colloquium of artists, scholars, and citizens exploring the intersection of digital technologies, new economies, and art to further our collective understanding of alternative economic models and their contemporary impact. Karen Gregory has written an insightful and lucid review of this performance, "Quality is Our Recipe: Gaming the Lost Affect of Care" in Women & Performance which can be found here. The Art Bulletin's Digital Future? 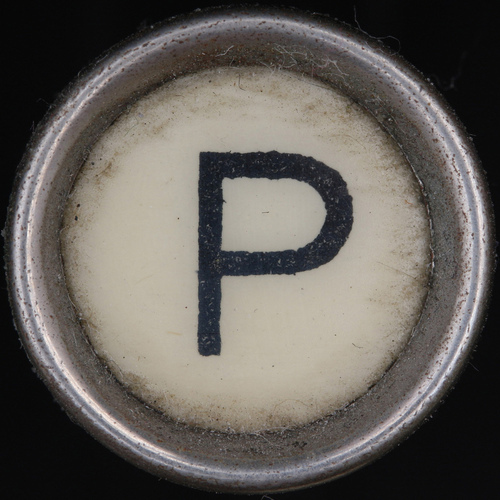 I will contribute a project for "Oblique Strategies" curated by Emmy Mikelson at Pace University's Peter Fingesten Gallery. 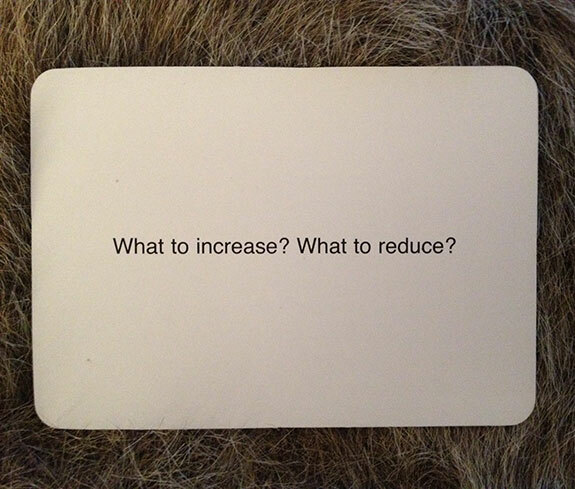 "Oblique Strategies" is a set of cards created by Brian Eno and Peter Schmidt first published in 1975. Each card contains a phrase or cryptic remark, which is meant to be used as a catalyst for generating or resolving work. Artists were invited to make new works, or alter old works, by responding to a randomly assigned phrase taken from the deck of cards. The show considers the structuring of dilemmas as a tool of production and the many approaches it can generate: literal, metaphoric, ironic, critical, humorous, etc. I'm beyond humbled to contribute to this fantastic volume from punctum. ANNOUNCING: the line up of contributors for Speculations of the Other Woman: New Realisms in Feminist Philosophy edited by Michael O'Rourke, Katerina Kolozova, and Ben Woodard which will be published by Punctum Books in 2015. Ain't I a philosopher? It's possible that I am one, but ... if I'm a philosopher it is at the price of a tremendous violence, the violence that philosophy constantly does to me and the violence I inflict on it in return. My relation to philosophy looks a lot like a constant, fierce quarrel between a man and a woman. But the outcome of this battle is ever more uncertain and unexpected. As my thinking develops I am un-marrying, de-coupling, divorcing myself a little from philosophy. I am thought absolutely, thought isolated, absolutely isolated. I cross the philosophical field in an absolute solitude. And now there are no more limits, no more walls, nothing holds me back. It's my only chance. Perhaps something will come of this disorientation.